Have you ever tried solving a jigsaw puzzle cardboard side up? While not theoretically impossible, it can be done with determination, time, and an understanding of how the puzzle is solved. Most jigsaw puzzles are rectangular, solving for at least the borders upside down does not take much effort. From there, time and perseverance is the best solution to solve the inside pieces. Building a supply chain network model without proper model strategy and design is like solving a jigsaw puzzle, upside down. Model strategy and design creates a foundation that adds color and depth to network design models that, otherwise, would be monotonous and void of true business value. 1. Will the model answer strategic or tactical questions / scenarios? 2. What level of detail can the business provide historical transaction data? 3. What level of detail can the business provide operational costs and capacities? 4. How knowledgeable and experienced are the modelers? Answering these 4 questions will drive how the model is designed and developed. Identifying model objectives, if those objectives can be modeled using available data and resource expertise, are fundamental to achieving value from a network design study. Once a border is established, the most time and effort is spent tackling the interior pieces of a jigsaw puzzle. Utilizing a process reduces this time and effort. Typically, the interior is solved by grouping pieces by color and object within the puzzle picture. Once enough smaller groups are solved, larger groups can be linked to ultimately connect each of the 4 borders together. Utilizing a model design allows the model to be broken up into smaller, more manageable development pieces. 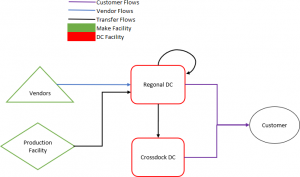 Model designs are best depicted using a flow chart; visualizing how products flow from supplier / manufacturers through the distribution network and are ultimately delivered to customers. When developing the input tables needed for the optimization approach of choice, model design will allow the modelers to focus on each individual leg of the supply chain; modeling complexities with business acumen without losing focus on the bigger picture. As each leg is developed and connected, a more robust and accurate model is created. The model design provides the direction and clarity required when working with complex supply chains. Like a jigsaw puzzle in its box with the pieces scrambled, a supply chain network model can be equally complex and intimidating. With the right model strategy and design the development process can be simplified in the same manner a jigsaw puzzle can be tackled. With the right approach and orientation, creating network design models and analyzing various scenarios can be a fruitful endeavor and provide a holistic picture of your supply chain. How you approach model development will determine if your model output will be a brown cardboard rectangle or the Mona Lisa.